If you're ever unsure of the working definition of "jingoism", I encourage you to do a Google Image search of Freedom Isn't Free. Anyway, enough digression. Real non-news! 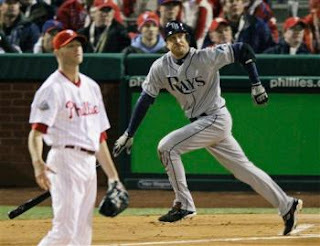 Rocco Baldelli is one of 50-odd players to file for free agency mere hours after the completion of the World Series. Hooray! He's on the open market! Despite Baldelli's ability to play well when he is in the lineup, the fact he must still deal with the effects of his malady makes his a unique situation. The Rays, and other teams who might be considering making a bid at Baldelli, must decide how much value they can give to a player they can't count on to play every day. Both the team and Rocco himself are saying All the Right Things, with Rocco acknowledging the team made a logical business decision (to decline his option) while still treating him with dignity and supporting him throughout his comeback. Rays GM Andrew Friedman has admitted publicly to a strong personal relationship with Rocco, something that surely won't cloud his brain when he seeks a hometown discount. There has been some talk of offering Rocco a minor-league deal, giving the chance to win a job and a heavily incentive-based contract. As Adam Loewen showed the good people of Baltimore, sometimes players hear whispers. The Boston Globe's Nick Cafardo already suggested Rocco as an ideal fourth outfielder for the Red Sox, another type of homecoming for Rocco. The kind that makes skin crawl in both Toronto and St Pete. I'm on the record (over and over) stating that Rocco the Blue Jay makes sense to more than just my latent homosexuality. If the Jays don't pick up a DH-styled slugger (Hank Blalock? Billy Butler? Please let it be Billy Butler), meaning Snider and Lind are to break camp splitting time between LF and DH, Rocco would be an IDEAL fourth outfielder. Thanks in no small part to Overmanagin Joe Maddon, Rocco's role this season wasn't true platoon but he was certainly more involved than Mencherson late in the season. Despite Tinkerin' Joe Maddon consistently defensively replacing him late in games, Rocco's an outstanding defensive outfielder with a strong arm that could serve as something of a (gasp) Reed Johnson-type in the Jays outfield. He could mentor both conscientious defensive objector Adam Lind and inexperienced route-taker and noted burlyman Travis Snider. The Dome would keep him from stiffening up in the cold weather of the spring and fall, his reasonably even split stats would allow him to step in against tough lefties and spell Vernon Wells when he gets his inevitable case of the ouchies. This probably won't happen, for several reasons. Rocco will re-sign in Tampa being the most prominent. The Jays obviously aren't too concerned wit the bench production in their outfield and loading up for 2009 is a very limited possibility. But a guy can dream. I too am gay for Billy Butler, though in a mostly non-sexual way. He could either live right in the Skydome Hotel (been done) or sacrifice BJ Ryan and use his husk for warmth.